Who first saw the patient? Usually, a triage nurse will evaluate the patient before the patient is officially checked into the emergency department (ED). How did the patient arrive at the ED: by car, squad, or helicopter? 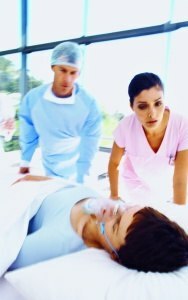 When did the patient go to the ED in relation to the accident? Was the patient seen in the ED the same day or was the visit delayed? What were the complaints of the patient? Were these the same complaints documented by the rescue squad at the accident scene? What were the injuries? If the patient was rear-ended, are low back or cervical spine symptoms documented? (These symptoms may not occur until twenty-four hours or more after the accident.) Were lacerations severe enough to be sutured? What x-rays were taken, and what did they show? If the patient complained of pain in a limb, was the correct limb x-rayed? Is there documentation of the use of a seat belt? Is the patient described as having been restrained at the time of the accident? Often this fact is changed in subsequent records. At times, the patient who is unrestrained at the time of the accident may claim to have been using a seat belt when giving a history of the accident to a treating physician. Did the patient report a loss of consciousness at the accident scene? Is this consistent throughout subsequent records? Did the patient have chronic medical conditions? Look for seizure disorder and transient ischemic attacks (potential for raising questions of liability), arthritis (pre-existing condition), deafness (potential for raising questions on liability), hypoglycemia (drop in blood sugar which may result in lowered attention and may contribute to causing an accident), and glaucoma or cataracts (decreased vision may have contributed to the accident, particularly if it occurred after dark). What medications was the patient taking on a routine basis at the time of the accident? Look for sedatives and narcotics, which may cause drowsiness. Use of narcotics or other pain relievers raise questions about pre-existing conditions. Use of eye drops raise issues concerning visual acuity. A history of treatment with antidepressants may be significant if the patient claims to have developed depression as a result of the accident (as a new condition instead of acknowledging the existence of a pre-existing condition).